To get a rough idea of the participating countries have a look at the following picture. Within the project Germany (yellow) and Italy (red) are considered the northern countries – India (purple), Vietnam (blue) and Mauritius (green) the southern countries. One can easily guess that this group of countries is far from homogenous concerning sustainability, carbon dioxide emissions, press coverage, religion, politics etc. Knowledge about the status quo and how to communicate our message in each country is crucial for our project to succeed. Being wide apart internet based campaigns seem like a good solution. But although our time is considered the technology age not everybody on earth has access to internet or is using it. The numbers of internet users per 100 people (data from 2008) give a first impression about possibilities and limitations to spread our message by the means of the internet. 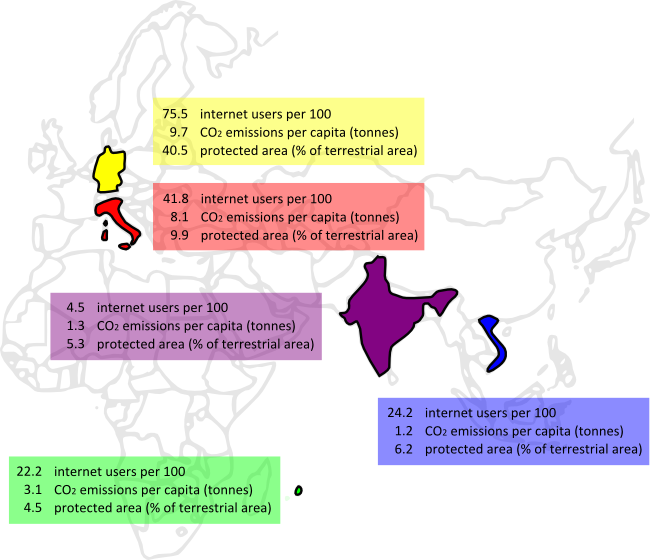 Carbon dioxide emissions per capita in tonnes (data from 2006) and the percentage of protected area of the terrestrial area (data from 2009) can be considered factors of sustainability. All data were taken from http://hdr.undp.org/en/.